Hunlock Creek Railroad Station (DL&W Station #452) in Hunlock Creek, Pa. The station is on the former DL&W Bloomsburg Line in northeastern Pennsylvania. The building dates back to the 1800’s. Through the years The Lackawanna and Bloomsburg, Delaware Lackawanna and Western, Erie Lackawanna and finally Conrail operated on the tracks at the station. The railroad at Hunlock’s Creek has long since been abandoned. Years ago the tracks, etc. were removed. The Bloomsburg Line ROW is now part of the Susquehanna Warrior Hiking Trail. The old railroad station has been privately owner for many years. Through the years, the owner has actually raised the building and built a cinder block foundation and installed sheeting over the exterior. The building was then used for storage. At the present time, the building and surrounding properties are a part of a large estate.The railroad station is deteriorating from the top down. The pagoda style roof has large sections which are in very bad shape. The bad roof is allowing the elements into the upstairs. The plaster and lathe rooms up there are very poor condition. Fortunately, the rot and decay is limited to the upstairs. The main floor of the station is quite solid. The original tongue and groove floor, wall and ceiling boards are still in good shape. However, the building is completely littered with the contents that was once stored there. In the summer the building is nearly hidden by all of the vines and overgrowth. This old railroad station is the last of it’s kind in our area. It’s a shame to see it just rotting away. It is a nostalgic railroad treasure right here in Hunlock Creek, Pa. 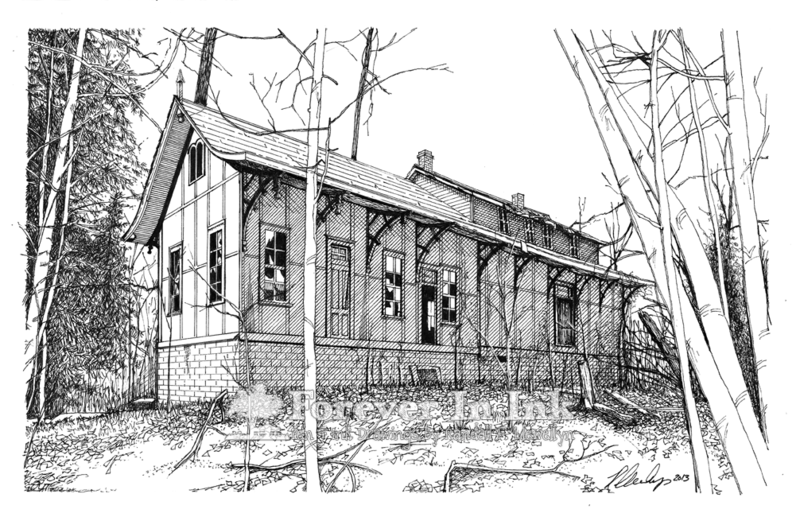 This entry was posted in Artwork and tagged Drawing, Hunlock Creek, Hunlock Creek Train Station, Line Art, Pen & Ink, Pen and ink, Pennsylvania, Train, Train Station. Bookmark the permalink.